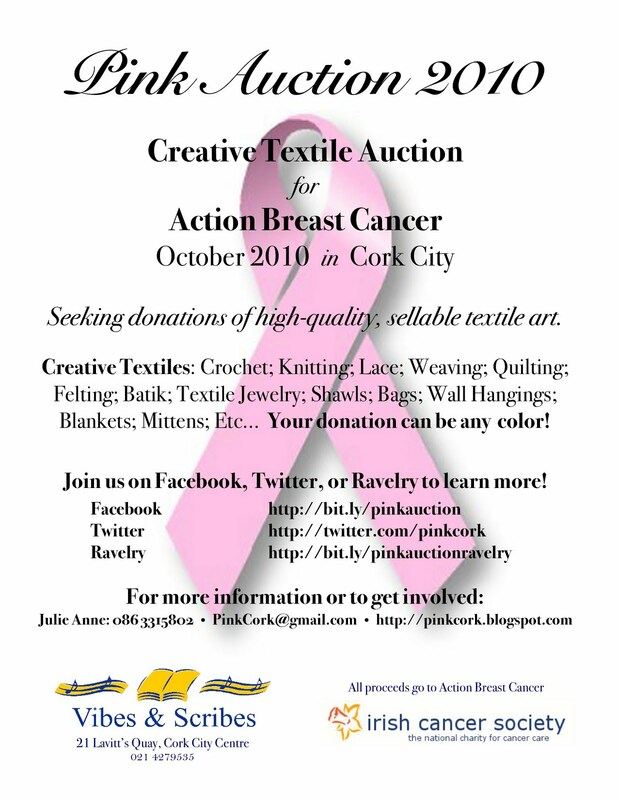 Textile artists, knitters, and crocheters who wish to spread awareness, compassion, and understanding for cancer charities, patients, and researchers. 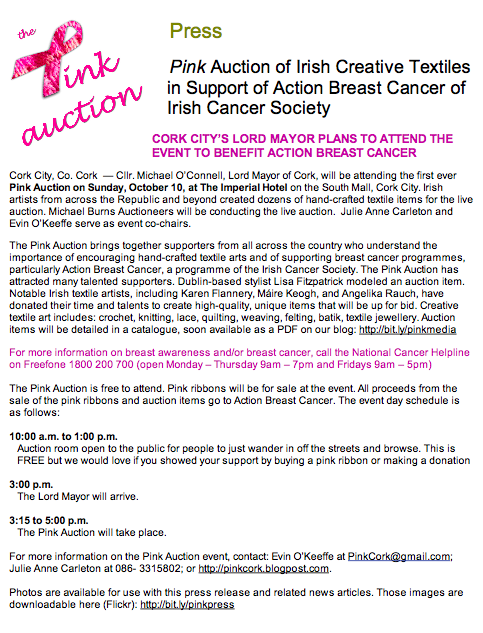 This page shares links to all downloadable and sharable media related to the Pink Auction 2010. Every attempt is made to note the version or upload date beside links. This press release offers information for the media. For a choice of photographs that can be used in conjunction with this press release, please visit HERE. A model release can be provided for Máire O'Sullivan if necessary. The top half of the form is for internal use only while the bottom half is for the auction catalogue. We respect all donors' privacy and if someone choose to remain anonymous or donate in memory of a loved one, that is made possible with the options. This form was designed by local artist Evin for this event. This flyer was designed in coordination with Vibes & Scribes on Lavitt's Quay, one of the city's leading fabric, wool, and fibre arts supply shops. 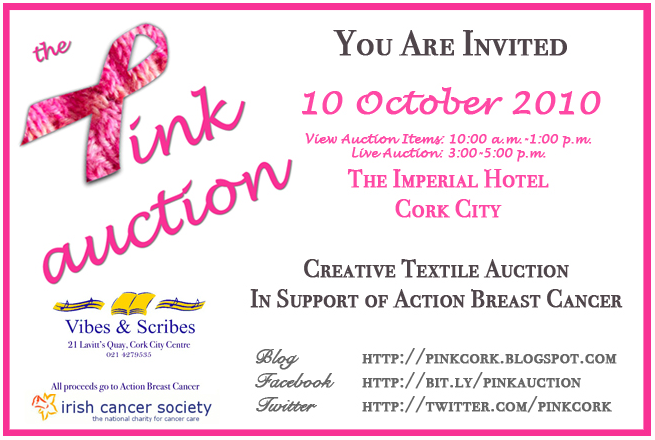 Textile artists, knitters, and crocheters who wish to spread awareness, compassion, and understanding for cancer charities, patients, and researchers. No agenda. We are not a charity, just a sounding board to spread the word about reputable efforts and organisations. We held a creative textile auction on Sunday, 10 October, 2010 at The Imperial Hotel in Cork City to raise funds for and awareness of Action Breast Cancer of the Irish Cancer Society. 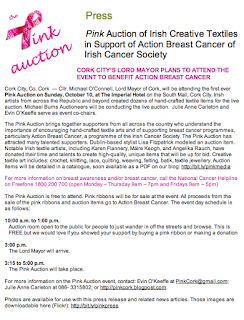 We raised about €3,000! Now this blog is just a sounding board to spread awareness, compassion, and understanding for cancer charities, patients, and researchers.